Linux packet stations can be used for mail, chat, and even sending messages long distances via the International Space Station. Packet radio is an amateur radio technology from the early 1980s that sends data between computers. Linux has natively supported the packet radio protocol, more formally known as AX.25, since 1993. Despite its age, amateur radio operators continue to use and develop packet radio today. A Linux packet station can be used for mail, chat, and TCP/IP. It also has some unique capabilities, such as tracking the positions of nearby stations or sending short messages via the International Space Station (ISS). In the early days, packet radio relied on a special piece of hardware called a terminal node controller (TNC). A TNC is a modem: it plugs into a two-way radio and uses audio tones to send and receive data. Now that computers are more powerful, it's often simpler to use a software modem. 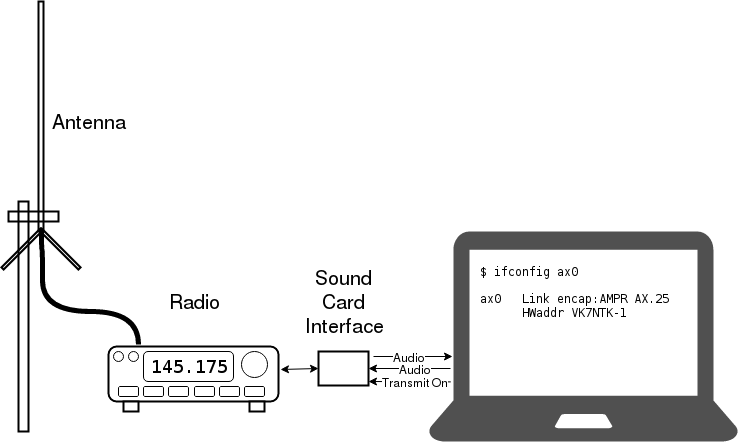 With free and open source software, a Linux PC with a sound card can become a TNC and communicate with other packet radio stations. Common transmission speeds are 1,200 and 9,600 baud. (For comparison, a 56K modem is 56,000 baud!) By today's standards this is very slow, but in exchange it works over long distances. Packets are commonly sent tens of kilometers without line of sight and without relying on any infrastructure other than the radio and antenna at each station. Some amateur radio operators prefer to build high-bandwidth networks (such as Broadband-Hamnet, which uses Linksys and Ubiquiti hardware) that typically use WiFi equipment rather than packet radio. The axcall program connected to a BBS. 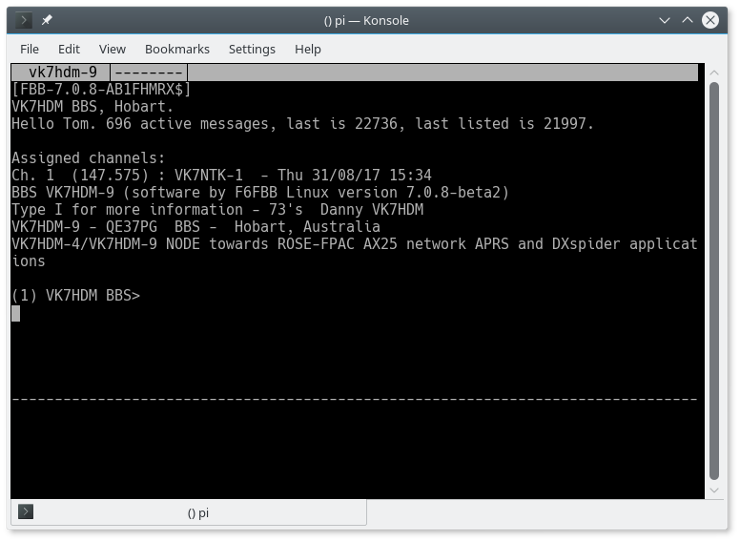 Since the internet's arrival, the bulletin board system (BBS), so common in the 1990s, has become far less popular, but it lives on in packet radio. When every byte counts, a text interface is an efficient way to read your mail. Accessing a BBS creates an AX.25 connection, a temporary link between the caller and the BBS. Like TCP, both ends acknowledge the packets they receive, so any that go missing can be retransmitted. The connecting station can use intermediate stations called digipeaters to specify a route for the packets to take. By passing packets along a series of digipeaters, stations that normally are out of range can connect to each other. On Linux, the axcall program creates a connection to a remote station and provides an interactive terminal for sending and receiving text. This is ideal for communicating with BBSes and mailboxes. The screenshot above shows a connection to a bulletin board using FBB, a popular BBS application. Its features include message boards, real-time chat between connected users, and file uploads and downloads. The Automatic Packet Reporting System (APRS) is another packet radio application. Its most popular use is transmitting locations in real time. Operators can use it to share their location, either at home or by attaching a radio to their car. A packet can indicate other objects of interest, such as radio repeaters or temperature data from weather stations. Xastir is graphical software for Linux that generates APRS packets and plots the data it receives on a map. 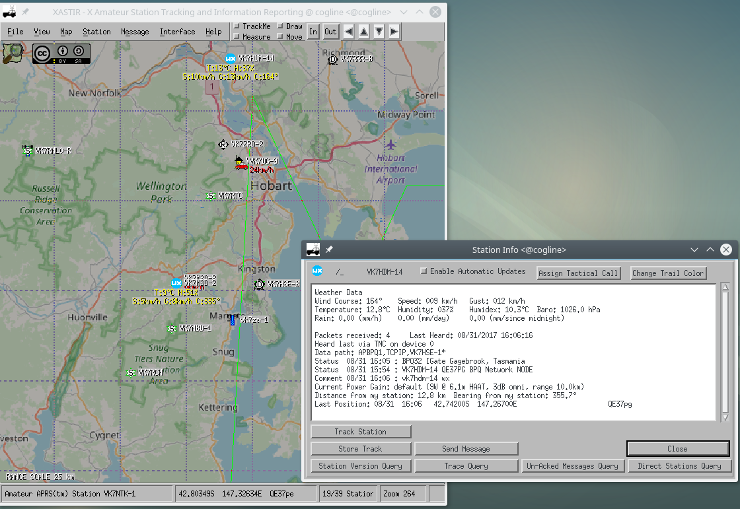 APRS uses a different communication style from BBSes. All APRS transmissions are standalone packets, similar to UDP (User Datagram Protocol). Nearby digipeaters rebroadcast the packet, and it ripples outward from the original sender. In addition to position reports, the protocol can broadcast short text bulletins and direct messages to other stations. The APRS network is linked globally using internet-connected gateways. When a gateway receives certain packets on the radio, it uploads them to the global system. A large amount of APRS traffic is captured this way; the locations of all stations can be viewed on websites like aprs.fi. The ISS has an APRS digipeater, and Earth-bound stations can use it to send messages to each other over long distances—provided they can do it during the few minutes while the ISS is passing overhead! For those who want to use ordinary TCP/IP software, Linux can send IP traffic over AX.25. This enables common protocols like Telnet, IRC, and HTTP to work over the radio. The rules of amateur radio generally disallow encryption or any commercial use, so SSH or passing ordinary internet traffic is forbidden. The entire 44.0.0.0/8 range of IPv4 addresses was set aside for AMPRNet, a global IP network of amateur radio operators run by volunteers. Computers on this network can operate in an isolated cluster or interconnect with other parts of the world via VPN. The long-term goal is to replace these connections with radio links where possible. These are some popular uses of packet radio—but anything is possible. Amateur radio is all about experimentation and building new things. A $40 handheld radio and a PC are all that are needed to start receiving nearby packets. Transmitting requires an amateur radio license. There are many packet radio resources online. Dire Wolf is a popular open source AX.25 modem with excellent documentation. Larry Kenney wrote a detailed series of articles about the foundations of packet radio. The Linux implementation is described in the AX.25 how-to. Don't forget: There are amateur radio clubs all over the world. Visitors are always welcome, and they will gladly assist newcomers who want to join the hobby. Tom Karpiniec - Software developer from Tasmania and amateur radio operator VK7NTK. Tom has a background in programming for home automation and mobile devices and enjoys experimenting with digital radio modes. Blogs at https://thomask.sdf.org/. I've been looking into the idea of a small emergency system to be used in the case of a Carrington Event - or perhaps for disasters like the recent hurricanes. A small pc (pi zero, keyboard and screen and solar + battery) and something like this to do simple comms and this looks interesting. Is there anything with higher bandwidth/shorter range? Bandwidth increases with increasing frequency (at the expense of range). A lot of ham radio operators use the "high frequency" bands (<50 MHz) for long distance communication. However, APRS is commonly used on the 144-148MHz bands, which is the most commonly-used band for local (e.g. metro area) communication. I think licensing might be a problem so I'm looking into CB - it might be possible to use multiple channels (if unused locally) to increase bandwidth of I can find a module that might support that... should be enough to develop a local area system which can then look to longer ranges. On cb you could use 27235 here is some traffic in europe. We have used 4k8 in holland 15 years back. Hi, MadTom - Getting your ham license is really easy - one weekend of study should get you there. Check out www.arrl.org for licensing info. There are Volunteer Examiners all over the US. And, in my opinion, you can do a lot more (Legally) on ham radio frequencies than you could dream of in CB. Definitely! There are Linux and Android projects for this purpose, though I have not tried them out myself. You might like to look at B.A.T.M.A.N., and also the FreedomBone mesh system which runs on a BeagleBone black and provides a number of tools out of the box. Great paper, thanks ! What good souvenirs! Check this : http://f1my.free.fr/Packet/ip-map.htm We were running at 9k6 bauds on UHF. 1999 is the year where I (f5tmz) and an old friend f5sio managed to handle for the first a webcam transmission over IP/AX25. 1 fps every 5 or 10 mn lol.